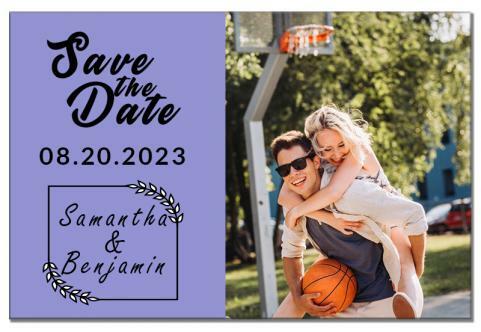 Let off the basket of emotions by getting your wedding dates imprinted on these personalized basketball save the date magnets 4x6 inch square corner 20 MIL. These magnets are perfect choice basketball lovers trying to announce their big day in style. Being made to last, these magnets are sure to get your wedding day inscribed on minds of your guests. You can avail value benefits by bulk ordering these magnets from us. Free shipping, free art setup and free online design proof can be availed on all magnet orders here. Request a quote to know discounts that may fall in your kitty by bulk ordering these custom basketball save the date magnets 4x6 inch square corner 20 MIL.